CANTON, Mass. 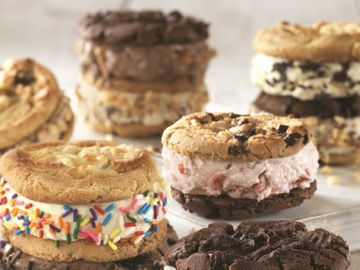 (April 1, 2014) – Baskin-Robbins, the world's largest chain of ice cream specialty shops, today announced the launch of a new online cake ordering system for guests nationwide, making it even easier to customize and order the brand's delicious ice cream cakes whether guests are at home or on the go. Guests can now visit www.baskinrobbins.com/onlineordering to browse through Baskin-Robbins' gallery of creative and eye-catching ice cream cakes, perfect for any party or celebration, and can create their own customizable cake by choosing their favorite ice cream and cake flavor combination. Baskin-Robbins guests can choose from a wide range of options when creating their own ice cream cake, including several cake shapes and sizes, and a variety of ice cream flavor and cake combinations. These include Baskin-Robbins' adorable Bunny Roll Cake, which is perfect for any spring celebration. Upon visiting the online cake ordering site, guests will be prompted to enter their address or zip code to be directed to place their order with their nearest participating Baskin-Robbins location. Each cake can be customized with one of up to 16 Baskin-Robbins ice cream flavors like Mint Chocolate Chip, Jamoca® Almond Fudge or OREO® Cookies 'n Cream, and one of two cake varieties, Chocolate or Vanilla. Guests can also choose from a variety of additional items, including birthday candles, to make their get together or celebration even more special. Online cake orders will be available for pick-up on the date selected by the guest, with cakes available as soon as 24 hours after the order is placed. 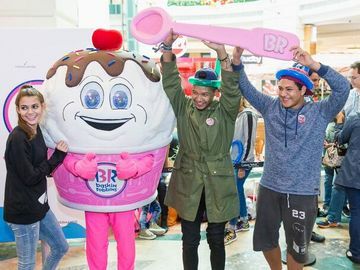 "At Baskin-Robbins, we're always looking for new and innovative ways to enhance the guest experience and to further connect with our customers," said Bill Mitchell, President, Baskin-Robbins U.S. and Canada, and Baskin-Robbins & Dunkin’ Donuts China, Japan and Korea. "We are excited to introduce online cake ordering to our guests nationwide, giving them another easy and convenient way to customize and order their own Baskin-Robbins ice cream cake in a fun and interactive way." Baskin-Robbins’ new online cake ordering offering is now available from participating shops nationwide. To find a participating location, guests can use the "Find a Shop" feature on www.BaskinRobbins.com and look for the “Order Online” icon next to the store location. More information about Baskin-Robbins' online cake ordering can also be found at www.BaskinRobbins.com/OnlineOrdering. Baskin-Robbins currently has more than 2,450 locations across the U.S. For more information about Baskin-Robbins and its wide variety of frozen treats, visit www.BaskinRobbins.com or follow us on Facebook (www.facebook.com/BaskinRobbins), Twitter (www.twitter.com/BaskinRobbins) or Pinterest (www.pinterest.com/baskinrobbins31).